We are Trident Silver – An industry leader in silver bar manufacturing and design. Neptune, the Roman god of the seas and fresh water bodies is usually depicted with a Trident, a three-pronged spear. This symbol of mythical power was chosen as our symbol as we strive to revolutionize the silver bullion bar industry. Neptune used his trident to shatter rocks, control the seas and shake the earth. Our trident symbolizes the shattering of conventional silver bar designs and becoming a mover and shaker in the silver bullion industry. At Trident Silver you will find dedicated team of professionals providing some of the highest quality silver products on the market today. Our great working relationships with our global team of authorized distributors make Trident Silver a great partner in the precious metals industry. We are currently accepting applications from North America, Europe, Asia, Australia, and New Zealand. 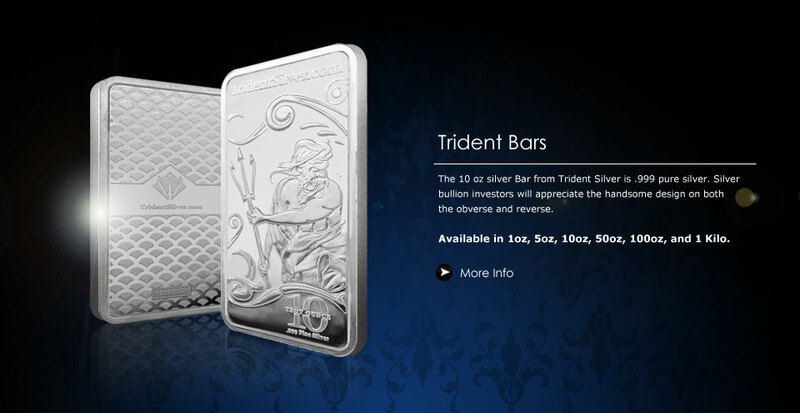 Submit your Trident Silver Bar serial number and the weight, and see the history of your bar.